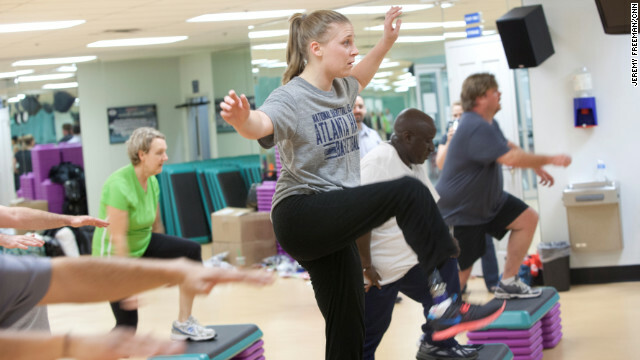 Denise Castelli does a strength training workout in Atlanta. Denise Castelli is one of seven CNN viewers participating in the Fit Nation Triathlon Challenge. When she's not swimming, biking or running, she's using her newfound to confidence to motivate others to change their lives. We’ve all had that horrible dream, right? The one where you have a microphone in your hand and you’re standing on a stage in front of hundreds of people only to look down and find that, to your horror, you’re standing in nothing but your underwear. Well, in my dreams when I look down, I happen to see only one leg. Truth be told, I do only have one leg. I also often find myself standing on stage holding a microphone in front of 200-plus people. During these moments, right before I speak my opening line, as I can feel everyone's eyes on me, I almost always glance down for a second and think, "So this is your life now?" I don’t know how I got involved with motivational speaking. It wasn’t something I set out to do. In fact, it all started as a way of giving back. While I was in the hospital, the boys' soccer program from one of the local high schools in Jefferson Township, New Jersey, raised money in my name. They heard what happened to me and wanted to help out. I was completely blown away by their generosity. I wasn't an alumna from this school, yet these student athletes heard my story and felt compelled to do something. When I was finally healthy and running around like a maniac again, the school asked me to come in and speak to the students - they asked me to tell my story. My story? Wait, I have a story? Sure, it’s not every day that someone breaks their leg playing in one of their final college softball games and somewhere along the way ends up right-legless. I get that. I know it’s a unique one-in-a-million occurrence. But what was every one talking about? What story? I began digging deep down into the depths of my soul (no joke) to find my platform. Before I knew it, I was having these extremely emotional writing sessions and asking myself some really hard questions. These were questions that I never wanted to answer and moments I never wanted to revisit ever again. But now, all of the sudden, I was. I had to find answers. It was the very base of my story. I'm sure I'm not the only adult to feel this, but I truly feel like I'm going to vomit whenever I walk back into a high school. I feel like I've just landed on some alien planet far, far away from Earth where they're speaking another language that I can't understand. Even so, some of my most memorable (and best) experiences have come from high school kids. Usually high school students find my final thoughts before I initially broke my leg most relate-able. When I tell them I was worried about senior week, graduation and what shoes I was going to wear out that weekend, they get it. They realize how life can change within an instant. The first time I spoke I was a blubbering, emotional mess. I had a notecard in my hand that I could barely read because I was shaking like a leaf. That nightmare I mentioned earlier in my blog? That had just become my reality. I could barely mutter out my name without wanting to sob. Oddly enough, the kids responded to my emotions and, in fact, ended up comforting me. They understood how tough it was for me to get up there. By the end of the day, I had ditched my notecard, found a rhythm and all my blubbering was just about gone. I didn't expect to be contacted by other institutions, but that day a fire was lit. I was now being contacted by various outlets, locally and nationally, to tell my story. After being a ball girl at the U.S. Open tennis tournament, it only grew. Now, because of my spot on CNN's Fit Nation Team, it keeps growing. When people ask what my audience takes away from hearing my story, I'm really not sure how to answer. When I scan the audience, I can tell that they are moved. I can see the wheels turning in their minds. People always approach me after I'm done to tell me some sentiment before I leave. Sometimes it can be as brief as, "I'll think twice before I take something for granted" or as touching as, "You've truly changed my life and I'm going to try to have a more positive outlook." I've even had a high school student approach me for my autograph. When I joked with him that I hoped he could sell it for money someday, he looked me in the eye deadpan and said, "No, I'm never selling this." What I do know is what I personally take away from sharing my story. I always joke and say it's my therapy and, frankly, it is. Though I don't want to remember how uncomfortable my prosthetic was at first and how I almost gave up on wearing it, I have to. Though I try to forget how long it took me to even look in the mirror or how long it took me to think of myself as beautiful rather than deformed, I need to remember. Still every now and then, especially in moments when I'm alone, I have a good cry rehashing some of the painful memories. At first I resented myself for doing it and thought it made me weak, but now I realize that couldn't be any further form the truth. It's all a part of who I am and where I am today and, quite frankly, I really like Denise. So even though I used to have nightmares about standing in front of people and telling my story, I now find comfort, confidence, pride and, most importantly, hope. If I have changed just one person's life through the course of my speaking engagements, then this entire journey has been worth it. What I can say for certain is how it's changed mine. I'm always blessed to share my journey. You can follow Fit Nation on Facebook and Twitter. Next entry »Arsenic in chicken, or just feathers? As cool as Denise is, I love seeing some of these people who've had this kind of setback or disability yet continue to live normal lives that aren't about their disability... but more about their ability. Kelly's a medical student, for example, and apparently is training for ultramarathons on the side (and was on Survivor). Amy Winters (another one who's pretty amazing) is basically a pro athlete competing against people with TWO legs- she did that death valley ultra a few years back. I could listen to your story all day long Denise and pray you keep telling it. Susan and I wanted to thank you for your Courage and to continue to speak to others. My son was a US marine; many times when they came back from War we went to their homecoming...we also went to many services for lost friends of my son, many times we went to meet those who came home early from combat who were severely injured. Some of those young men just like you were so severely injured we didn't even recognize them when we meet them face to face. I still stay in touch with many of them and the parents that lost a son in combat. Those who live and survive are those who get up just like you and move forward in a positive way. This year at our September 1, 2012 King Of The Smokies Triathlon ;Susan and I sponsor we desided to open our triathlon to Challenged Athletes, Wounded Warriors and Para-Triathletes. We got tired of hearing from many friends"I ran 8 miles, I swam 2 miles, I biked 1000 miles". It just doesn't work anymore when you see so many folks like yourself...deeply TRI-ing so much harder. Not only physically but mentally; times 1000!! You can do it, You Will Do It!! Have a nice Easter Denise we'll be up to see you sometime after Easter before you head out to the "Island"; we'll be stopping by to see your other Team Mate in Maryland too!! Just for a swim, a bike, or a run!! Wonderful story and effort...I get so tired of reality stars getting endless publicity for doing not so much. When here, we have an inspiring story that needs retold again and again. I doubt Kim Kardashian would have the heart. Thank you Denise. Keep inspiring people to reach the stars. The world needs more positivity. God bless.